At CHOC Children’s, we have the only pediatric program in Orange County designated by the Muscular Dystrophy Association to help families understand and manage muscle disease. That means in addition to an entire team of CHOC specialists who care for your child, we also partner with the MDA to offer access to national research and community support. The MDA recognizes more than 90 muscle diseases, many of which may present during childhood. The symptoms can be confusing and sometimes a diagnosis is difficult to make. Our specialists designate regular clinic time to spend with new patients who are looking for a diagnosis. We can exhaust every resource, including genetic testing, muscle biopsies, nerve conduction studies and electromyography. We can also connect you with social services, financial coordinators, equipment for home care and community resources. The Muscular Dystrophy Association is known as the leading nonprofit organization dedicated to finding treatments and cures for muscular dystrophy and other neuromuscular diseases. We are proud to be affiliated with the MDA so that we can commit to a shared mission. Because an MDA liaison attends appointments with CHOC patients regularly, your family will have access to support programs and the latest research being led by the organization. Learn more about the MDA. Muscular dystrophy is a group of inherited diseases that are characterized by weakness and wasting away of muscle tissue. Sometimes, there is also the breakdown of nerve tissue. There are nine types of muscular dystrophy, with each type involving an eventual loss of strength, increasing disability and possible deformity. Other health problems commonly associated with muscular dystrophy include heart problems, scoliosis and obesity. The most well known type of muscular dystrophy is Duchenne muscular dystrophy (DMD), followed by Becker muscular dystrophy (BMD). For a complete list of muscles diseases, visit the Muscular Dystrophy Association. Duchenne muscular dystrophy is a genetic disease which means it is inherited. It is caused by an X-linked recessive gene. “X-linked” means that the gene causing the trait or the disorder is located on the X chromosome. Genes on the X chromosome can be recessive or dominant, and their expression in females and males is not the same because the genes on the Y chromosome do not exactly pair up with the genes on the X. X-linked recessive genes are expressed in females only if there are two copies of the gene (one on each X chromosome). However, for males there only needs to be one copy of an X-linked recessive gene in order for the trait or disorder to be expressed. For example, a woman can carry a recessive gene on one of the X chromosomes unknowingly, and pass it on to a son, who will express the trait or disease. A tell-tale clinical characteristic for Duchenne muscular dystrophy (DMD) is Gowers’ sign. Children with Duchenne muscular dystrophy find it very hard to get up from a sitting or lying position on the floor. They first pull up to their hands and knees. The child walks his or her hands up their legs to brace themselves as they rise to a standing position. Blood tests. These will check muscle enzyme levels and genetic abnormalities. Muscle biopsy. This is the primary test used to confirm diagnosis. A small sample of muscle tissue is taken and examined under a microscope. Electromyogram (EMG). This test is used to check if the muscle weakness is a result of destruction of muscle tissue rather than nerve damage. Electrocardiogram (EKG). This test records the electrical activity of the heart, shows abnormal rhythms (arrhythmias or dysrhythmias) and detects heart muscle damage. To date, there is no known treatment, medicine or surgery that will cure muscular dystrophy, or stop the muscles from weakening. 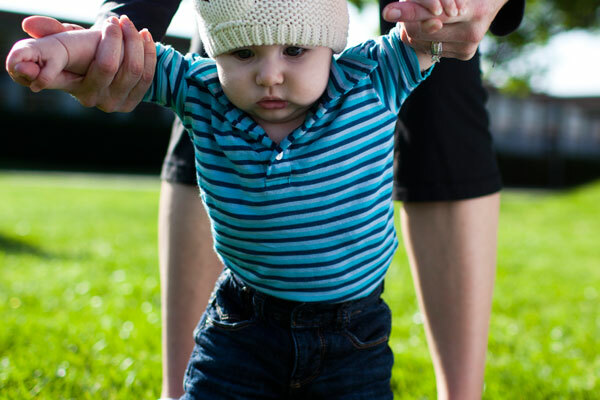 Since muscular dystrophy is a lifelong condition that is not correctable, we focus on preventing or minimizing deformities and maximizing the child’s functional ability at home and in the community. Positioning aids used to help the child sit, lie or stand. Braces and splints used to prevent deformity, promote support or provide protection. Maintaining the child’s ability to sit or stand. What is the long-term outlook for a child with muscular dystrophy? Our interdisciplinary team will work with your family to improve your child’s function and to provide support as you learn to care for your child’s needs. The Muscular Dystrophy Association can be an important resource, both financially and emotionally, for parents of children with muscular dystrophy. Learn more about the MDA. For more information on our program, please call (888) 770-2462 and press 2 for specialty care clinics. Please obtain a referral from your child’s primary doctor in order to schedule an appointment. For referring pediatricians, please call (888) 770-2462 and press 1.